His name is Hardy Cates. He's a self-made millionaire who comes from the wrong side of the tracks. He's made enemies in the rough-and-tumble ride to the top of Houston's oil industry. He's got hot blood in his veins. And vengeance on his mind. She's Haven Travis. Despite her family's money, she refuses to set out on the path they've chosen for her. But when Haven marries a man her family disapproves of, her life is set on a new and dangerous course. Two years later, Haven comes home, determined to guard her heart. And Hardy Cates, a family enemy, is the last person she needs darkening her door or setting her soul on fire. WATCH THE SPARKS FLY. . . . 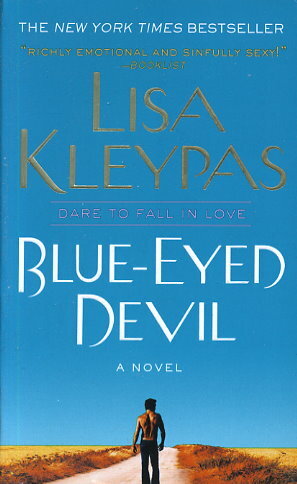 Filled with Lisa Kleypas's trademark sensuality, filled with characters you love to hate and men you love to love, Blue-Eyed Devil will hold you captive in its storytelling power as the destiny of two people unfolds with every magical word.